Elisabeth Gschiel – was born in Hartberg, Austria in 1975. Lives and works in Graz.. Educated in art and graphic design at the „HTBLVA-Ortweinschule“. Graduated in architecture from the Technical University of Graz, Master of Science degree. Worked at Szyszkowitz-Kowalski Architects and at LOVE architecture and urbanism. 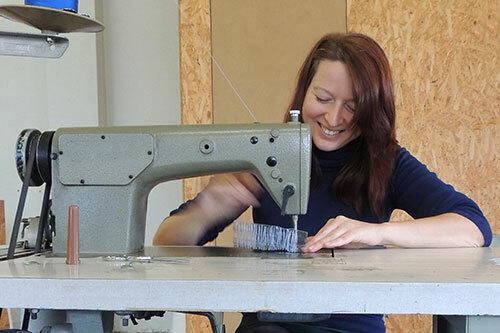 Since 2011 she is working on sewn plastic landscapes and plastic installations. She works mainly with used plastic packaging material, transparent plastic foils, paper and old Photographs. Member of a group of artists "Schaumbad- Freies Atelierhaus Graz". 2013, April-May Artist in Residence in Guimarães, Portugal. Supported by the Cultural Department of Styria, Austria.